We came to Cote for my fathers 70th birthday on 23rd, as my brother has been here previously and recommended the restaurant. Upon arrival we were greeted warmly and shown to our table on the terrace but as it was a little scruffy looking and the smokers had adopted the table next to ours we decided to dine inside; which was no issue as the restaurant was not busy. We ordered drinks and soon after ordered food with all bar one, having two courses (there is nothing suitable for a 3 year old diner). We were served bread which was deliciously warm and crispy, but this brassiere chose not to offer side plates – and at their prices and their discretionary service charge this is not what you’d expect… where does one place their bread!? The starters arrived we were all pleased with our choices. I had the prawns but they were a lacking chilli which was one of the reasons I chose them but there was plenty of garlic so the dish had flavour and well presented. The main courses: the majority ordered fillet steak in various guises with one rib eye and a sausage and mash for my nephew. 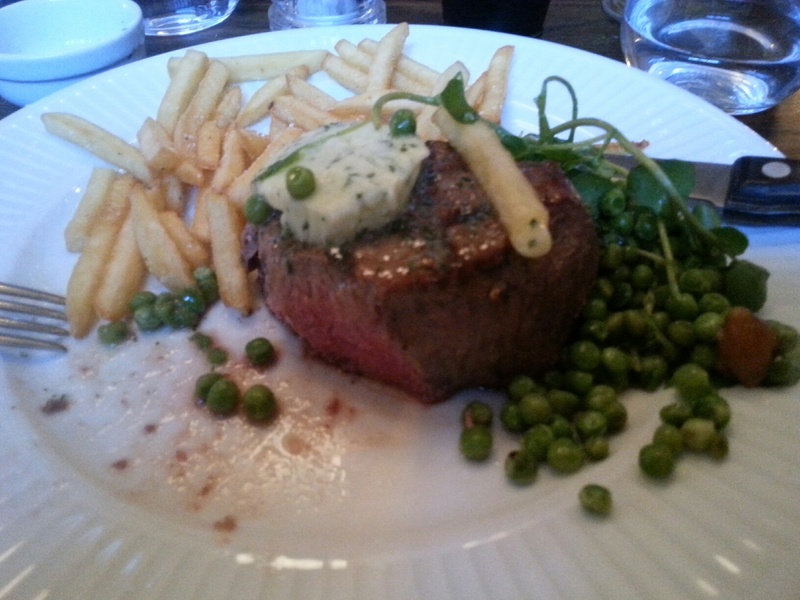 I chose fillet with Garlic butter and a side of minted peas. The fillet steak was well presented and hot and had been served on a hot plate (refreshing as so many restaurants serve hot food on cold or tepid plates). It had been cooked to my liking medium-rare, it was tender and very flavours some, top marks. The peas however, were wrinkled and were lacking in mint but had been seasoned. Desserts were ordered and I will always order Crème Brule which was a good standard. We asked for an Irish coffee for the Birthday boy, but the waiter advised this was not something Cote offered and without much fuss the waiter then rescinded and offered to make one which we appreciated. However, our gratitude soon did a U-turn as they chose to use a small wine glass and what should have been a steaming hot Irish coffee was a tepid rocket fuelled coffee. When we got the bill they had also charged for a double Jameson’s which we did not doubt had been used. I spoke to the manager as we concerned the staff were using doubles without saying especially after a few wines. She apologised and insisted in refunding – which was appreciated. Overall the steak was excellent, the service was good but I suspect their could be issues on a busy service; the waiting staff were not keep an eye on the “bus boys” who bring the food up from the kitchen. It is a wonder to me why do many restaurants sacrifice service over profit which can only lead to a downturn in business when it fails. Cost was just under £300 for 6 adults. This could be a Winder Winner; but for now it is three out of five until I see the team in action on a busy Saturday night.